I’ve waited SO LONG to have this post about THE intimidating macarons. I don’t know about you, despite how lush and tempting macarons Look, I often find them too pricey to bring home as a student. So, I might as well learn to make them myself, right? 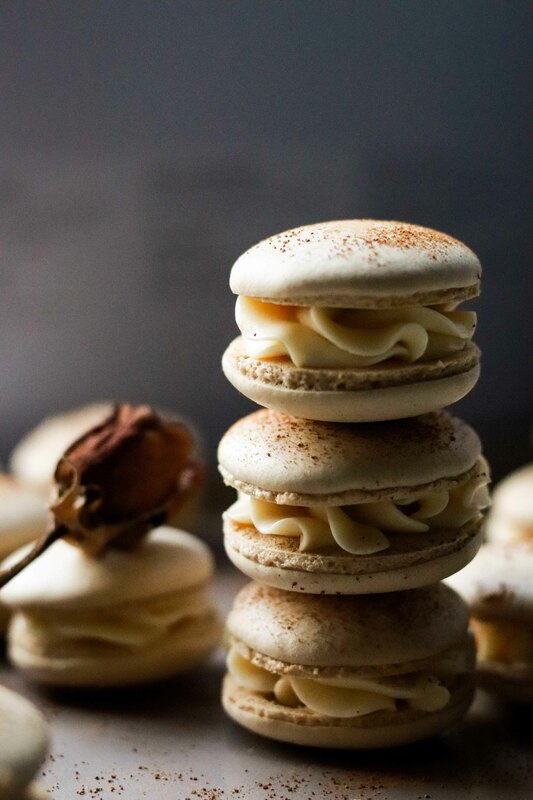 It’s no exaggeration to say that these tiramisu macarons are heavenly. Tell me, how can you resist it when you get a crispy coffee-flavoured almond meringue shell with a marshmallow interior, with some creamy rich and creamy mascarpone cheese buttercream layered between? The bitterness from the coffee justly tones down the macarons’ high level of sweetness that’d be considered a put off for certain people. Have a bite and you’d be brought straight to Paris. I am quite a perfectionist when it comes to baking. This is a double-edged sword, because while it always pushes me to strive for the best result, sometimes I could just break down for a not-so-good-looking muffin. However, ironically, here I am, ready to talk about the making of macarons – something that constantly forces me to deal with imperfection. Sometimes I’d pipe out macarons that aren’t the same shape and size on the baking sheet; sometimes the macaroon shells would crack when I was eagerly peeping through the oven door; sometimes the famous and essential “feet” simply wouldn’t show. In other words, there are tons of reasons for me to face frustration when making these little treats, or for me to doubt myself. But there’s one thing that I know for sure – to master anything I have to start somewhere, and coming to terms with initial failures is the way to go because that’s how I figure out what’s wrong and how to fix it. Preheat the oven to 150C, then put the trays in the oven. Bake for 15 minutes. Out of the oven, slide the shells on to the work surface. Let cool. Add softened butter and mascarpone cheese to a mixing bowl. Using an electric mixer, beat on a medium speed until smooth. Add icing sugar and coffee liqueur, continue beating for an extra minute until combined and smooth. Place the mascarpone buttercream filling into a piping bag topped with a rose nozzle and pipe it on the inside of the macarons and sandwich them together. Those look yummy! I much prefer homemade macarons as often those bought from shops can be disappointing, too dry or even too sweet. I say this as someone who lives in France and has plentiful access to said delicacy. Thanks for commenting. 🙂 Yes I do think some macarons can be too sweet. Wow, How lucky you’re to live in France and be able to enjoy French desserts all the time!